As tiny houses go, Bilbo Baggins’ hobbit-hole house may have been small in size, but it was big on comfort—much like the houses that are part of the tiny house trend that took roots in the Pacific Northwest. While Oregon and Washington both have thriving tiny house communities, the idea is spreading across the country. James Stoltzfus, owner of Liberation Tiny Homes, Lancaster, recently completed his first tiny house, which he is using as a sales model. Stoltzfus worked as a contractor with his brother Ray’s Lancaster-based company, Quality Decks and Additions, for the past 10 years, prior to forming his own company. “There is not another tiny house contractor in the immediate area or in the state that I am aware of,” Stoltzfus said. After talking with a friend, who attended the Colorado Springs tiny house builder Tumbleweed’s Dream Big, Live Tiny workshop in Philadelphia, Stoltzfus began researching tiny house construction plans. Shortly afterwards, Stoltzfus decided to use his spare time to build his first tiny house in his downtown Lancaster backyard. Last August, Stoltzfus attended the three-day Tiny House Jamboree in Colorado Springs. “There is a lot of interest in the tiny house trend,” Stoltzfus said, noting that about 40,000 people attended the event. Shortly after, he quit his job to become a full-time tiny house contractor. 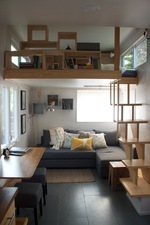 After collecting a number of tiny house floor plans, Stoltzfus designed his own floor plan. The completed house has 160-square-feet of living space on the main floor; and a 70-square-foot, second-level sleeping loft. “It’s made to travel,” Stoltzfus said of the tiny structure. He built his model, which weigns about 10,000 pounds, on a travel trailer-sized chassis and wheels to make it easy to move. Average prices for tiny houses range from $80,000-$130,000; average cost of materials is about $20,000. Some people, Stoltzfus said, have built tiny houses for as little as $10,000 to $15,000. In 2014, after searching for a tiny home to buy (their search was documented on HGTV’s Tiny House Hunters), Adam and Karen Freedgood decided to design and build a 280-square-foot home on 12 acres of undeveloped property in Equinunk, PA, in Wayne County. Located between the Catskill and Pocono Mountain ranges, the home is perched on a mountainside a few miles from the Delaware River. The cabin is off-grid, solar-powered and uses less than 1,800 kilowatt hours of electricity per year (over 80 percent less than the 12,000 kWh used by the average home in the northeastern U.S.). 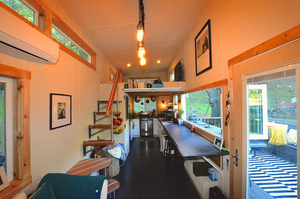 They documented the home-building experienced in their blog EquinunkCabin.blogspot.com. In Garrett County, in western Maryland, a company known as Hobbitat has been constructing and selling tiny houses since 2012. 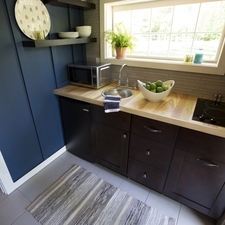 Located at Blue Moon Rising on the shores of Deep Creek Lake, in McHenry, Md., the company’s first major project involved building 13 tiny houses or “Hobs” as the company calls them. Stoltzfus said municipal building codes are just starting to be amended to allow tiny houses to be built on foundations. For now, Stoltzfus is building the tiny homes in compliance with the standard housing codes used by the majority of municipalities in Pennsylvania. “Home buyers can choose from half-baths to full-baths,” Stoltzfus said. 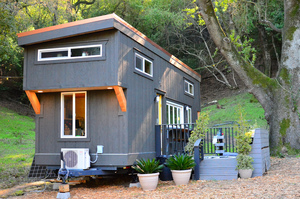 Many tiny home owners prefer to use composting or chemical toilets. Some reuse the “gray water” to irrigate their gardens. Written by Jeffrey B. Roth, a correspondent for Thomson-Reuters. Roth writes for magazines in Pennsylvania and Maryland.